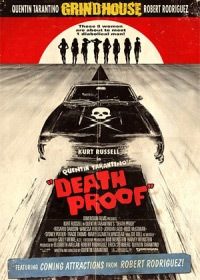 Death Proof is a 2007 action-thriller movie written and directed by Quentin Tarantino. It was released as part of the Grindhouse double feature along with Robert Rodriguez' Planet Terror. Starring Kurt Russell, Rosario Dawson, Sydney Tamiia Poitier, Vanessa Ferlito, Jordan Ladd, Zoe Bell, Tracie Thoms, Mary Elizabeth Winstead. Tagline: "A White Hot Juggernaut at 200 MPH!" Second half of the Grindhouse release, the other being Planet Terror. A psychotic killer named Stuntman Mike (Kurt Russell) stalks a group of young women as they spend their night in Austin, Texas, bar hopping, teasing boys, and getting trashed. Stuntman Mike proceeds to kill the girls by crashing into them head on with his death proof muscle car. Weeks later in Tennesee, he targets another group of young women who are affiliated with the film industry, but this time, he picks the wrong targets. This page was last edited on 5 September 2015, at 20:52.